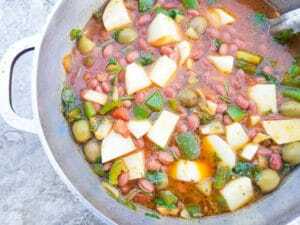 Habichuelas Guisadas (Puerto Rican Beans) | Mexican Appetizers and More! 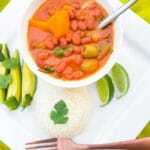 In my own home today, you will find habichuelas guisadas made every single week served with either yellow or white rice. They make the perfect comfort food when served with rice and any meat or seafood of your choice. Serve with avocado slices, garlic tostones or amarillos or maduros (fried sweet plantain slices) and boy oh boy will your taste buds be oh so happy! 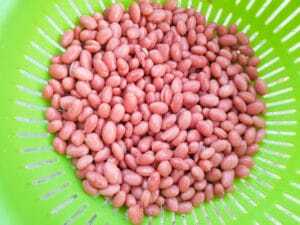 We also serve these delicious beans alongside sorullos or sorullitos. And dunk these fabulous creamy corn sticks in the savory sauce. 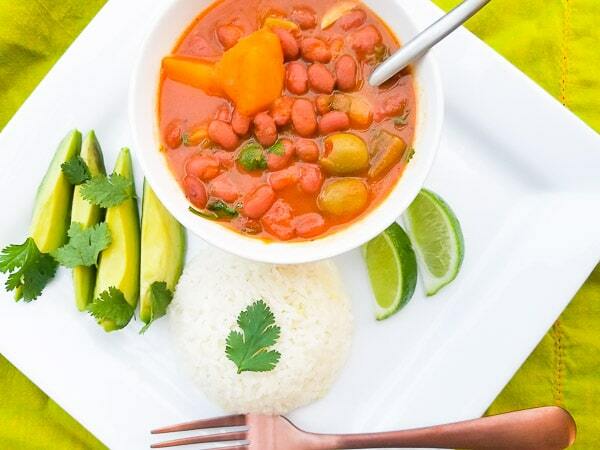 If you have never had Puerto Rican style beans, then I can pretty much guarantee that after you have had them, these will also become a staple in your own home. 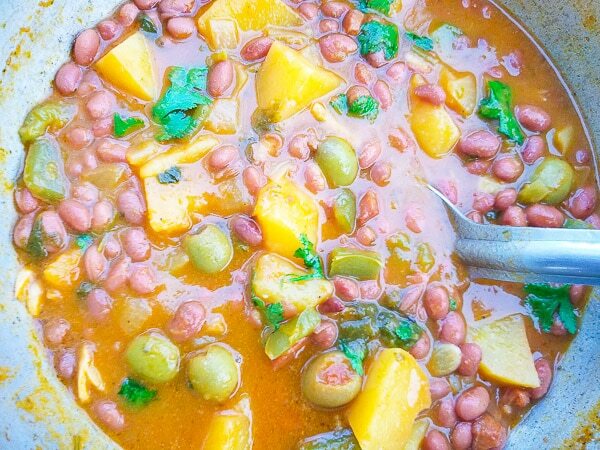 Habichuelas guisadas are very simple to make and do not require too much time to make. 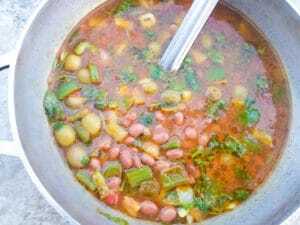 As long as you have followed my advice from a few weeks ago of always keeping a jar of homemade sofrito (a blended vegetable puree) in your fridge you will have a pot of these amazing stewed beans in under 35 minutes! And if by some chance you didn’t follow this blissful advice 😉 then no worries, you can always quickly whip up a batch in less than ten minutes or even buy store bought sofrito in the Latin section of your supermarket or Amazon. 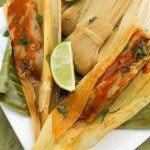 Note: If you live somewhere where you can find fresh culantro, add two leaves chopped to the sauce while cooking. 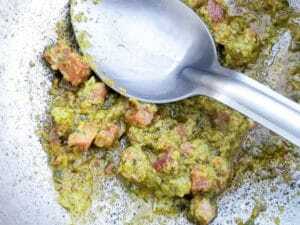 Culantro is another key ingredient in Puerto Rican cooking but is a little bit harder to find. However, if you can find it, your beans will be that much yummier! 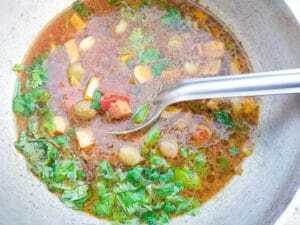 In a saucepan or caldero add a 2 tablespoons of oil over medium heat. Saute the ham. 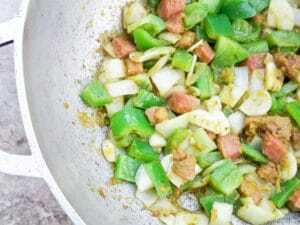 Add sofrito and stir fry with ham for 2 minutes. Then add the pepper and onions. Cook until slightly translucent and add garlic. Cook for a minute. 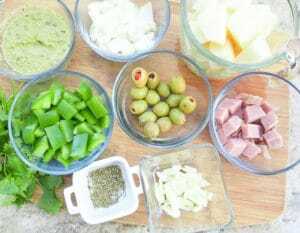 Add tomato sauce or paste, olives, cilantro, spices and water. 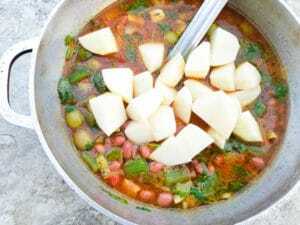 Add beans and potatoes and season with salt to taste. Cook for 30 minutes. Top with fresh cilantro once done. 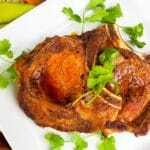 Serve with white or yellow rice and a meat of your choice. Some ideas are…. 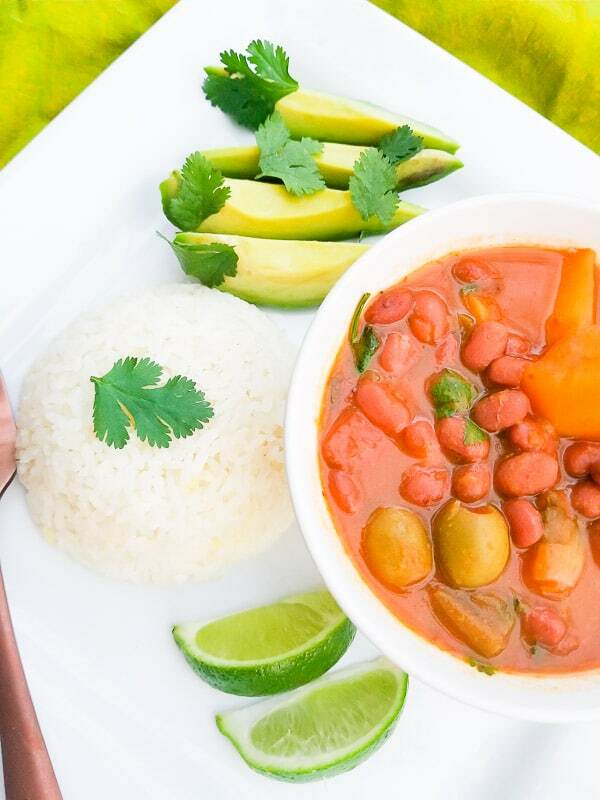 or simply serve yourself a bowl of rice and beans and make a meal of itself! For leftover beans, you must try Arroz Mamposteao (Dirty Rice with Beans)! Excellent! Sorullitos (Fried Corn Sticks) with a our delicious famous MayoKetchup Sauce, made with just 3 ingredients. 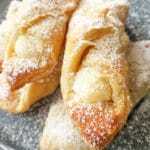 Pastelillos de Guayaba (Guava Pastries) perfect for breakfast, snack or dessert. 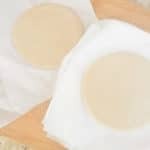 My favorite Puerto Rican pastry!!! 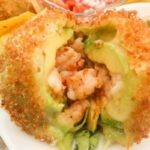 Rellenos de Papa (Stuffed Potato Balls) one of my absolute favorites!!! Then add the pepper and onions. Cook until slightly translucent. Add tomato sauce or paste, olives, cilantro and spices and water. Add beans and potatoes and season with salt to taste. Cook for 30 minutes. Top with fresh cilantro once done. Done. Serve alongside white or yellow rice with pork, chicken, beef or seafood. 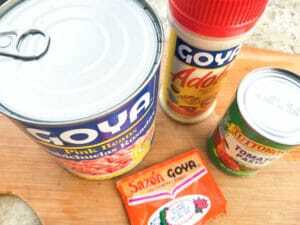 Note* If you do not have any homemade sofrito or are not in the mood to make any, you can purchase store bought ready sofrito by Goya brand in a red jar. You can also use one smoked ham hock, ham bouillon or smoked kielbasa instead of ham. These look so delicious! Adding these to the dinner menu! I adore every kind of bean I’ve tried and these look wonderful! I’ve never tried Puerto Rican beans before, but I need to because all of the flavours in here look a winning combination! You will not regret giving them a try! 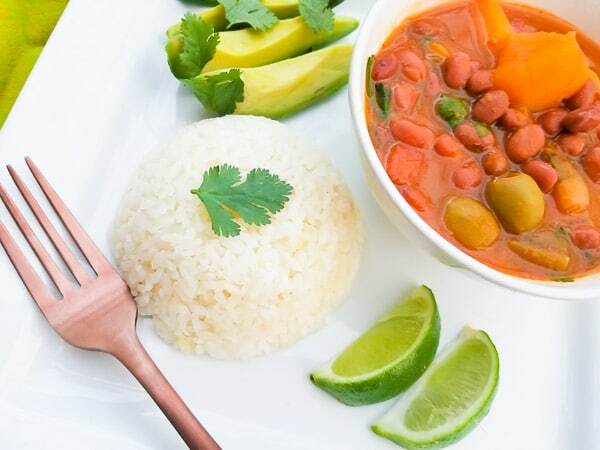 I have never tried Puerto Rican beans before, but seeing that we love all kind of bean dishes in the house, I bet this will get devoured in no time. Time to do some shopping. Great!! You will not be disappointed! That looks like a really hearty bean dish with loads of flavour. Definitely giving it a go soon!